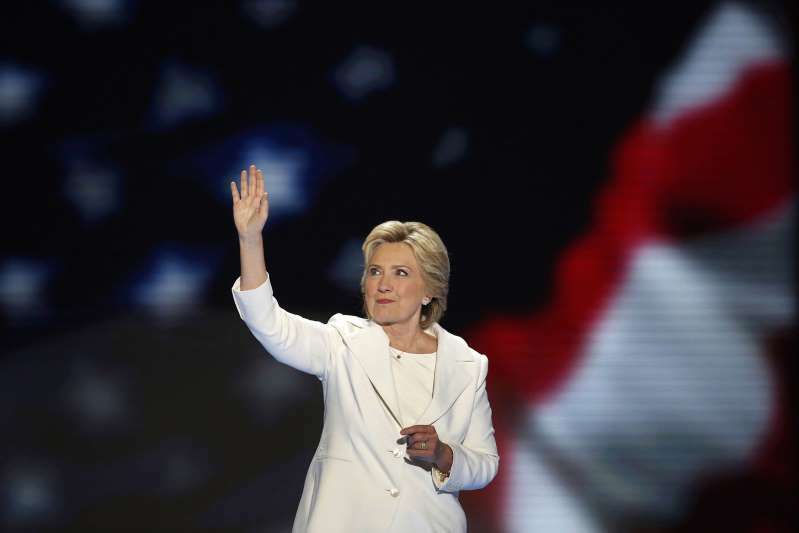 © Carolyn Cole/Los Angeles Times/T Hillary Clinton at the Democratic National Convention in Philadelphia on July 28, 2016. In 2016 Democrats were handed a gift named Donald Trump, a bumbling, blurting, barstool political ignoramus who nonetheless managed to insult his way into the presidency, despite all their "best" -- and I mean worst -- efforts. Now, as a midterm election that should favor the party out of power approaches, Republicans, energized by the Brett Kavanaugh fight, are poised to potentially pick up Senate seats. And I wouldn't be entirely shocked if Republicans surprise everyone and actually manage to keep the House. As far as 2020 goes, no one Democrats are currently shopping is a convincing match for Trump. Sure, Democrats are picking up local elections in places they perhaps shouldn't, running close elections in places they haven't before. But when it comes to Trump, they are losing. Big time. As a Republican, you might expect this to please me. It doesn't. I believe in a strong two-party system, and when one party is losing so spectacularly, it emboldens the other party to overreach and become a cartoon of itself, invoking awful things like -- I'm just spit-balling here -- child separation policies and trade wars. Recently a reporter for NBC, Ken Dilanian, tweeted, "It may not happen in our lifetimes, but the idea that North Dakota and New York get the same representation in the Senate has to change. 'Senators representing less than half the U.S. are about to confirm a nominee opposed by most Americans.' "
Adam Parkhomenko, political adviser to Hillary Clinton, tweeted giddily on Tuesday, "Don Lemon just slapped the s*it out of Matt Lewis live on TV." Lewis, like me, is a conservative who has spent the past few years criticizing Trump and the Republican Party. When liberals are irrationally angry at us, it feels misplaced. Either our criticism of Trump doesn't go far enough for them, or we haven't become full-fledged Democrats to prove our anti-Trump devotion. This is, of course, insane. Train your fire elsewhere. There is no more useless, ineffective and boneheaded decision liberals have made since Trump won than defending -- to the death! -- Hillary Clinton. For one, she was a terrible candidate; it's OK to admit that. For another, she polarized the country and half of us despise her. Pick a more strategic Joan of Arc. And lastly, she managed to lose to Donald Trump. And yet you want us to believe she still has important things to say? It sounds simple enough, but when reporters become Democratic talking heads, it helps no one. Trust in the media suffers, and Trump's many lies and misdeeds blur with what journalists have deemed egregious. The perception that the media is anti-Trump only works in his favor. And recognize Michael Avenatti for what he is: a carnival barker who should be disavowed by every Democrat running for election anywhere. Guys, I'm truly here to help. If Democrats don't take the House and the Senate as they're supposed to and defeat Trump in 2020, they'll have no one to blame but themselves. This shouldn't be that hard.